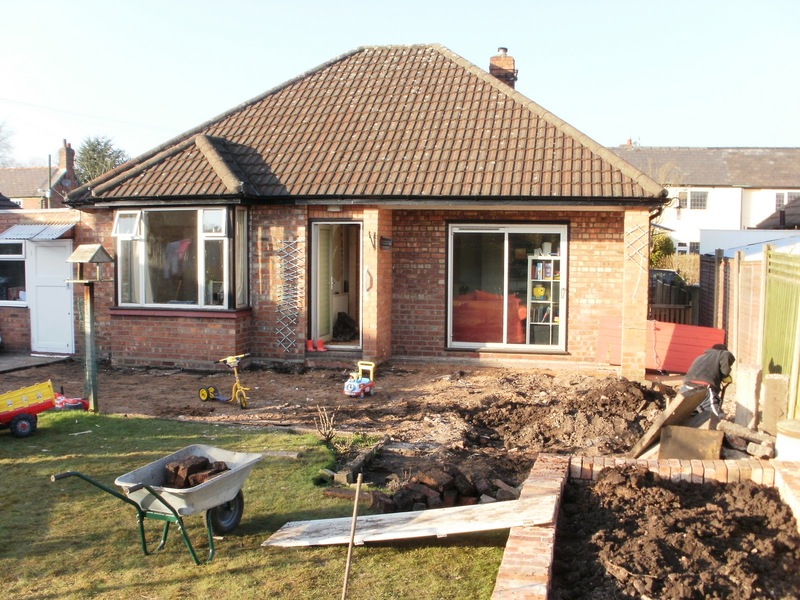 Two small boys, a husband and a renovation project: It's a rollercoaster of emotion! It's a rollercoaster of emotion! The builders started today! I’m so excited! The excited anticipation has been killing me all week. Every time I’ve thought about it I’ve wanted to do a little dance. We only moved here five months ago but it feels like we’ve been waiting forever for this day. In order to get the builders started today, Project Manager has been slaving away on the back-breaking work of lifting the patio slabs (it’s about 9 x 4 metres) and digging new drainage to divert around the plot. Wee Boy 2 fell off the new wall around the veggie garden – we thought he might have broken his nose but after the swelling went down and he resorted to those resigned snuffley sounds we decided it was just a bump and nose was still ok.
We had more progress on internal alterations too – another week, another wall – as the new stud wall went up in the corner of our (current) living room and we knocked a doorway through to allow access in the interim. We spent a beer-fuelled evening stripping wallpaper in the (current) master bedroom only to spend 3 days debating whether to remove the plaster or decorate over it and hope the mould didn’t linger and seep through. The final conclusion was to remove the plaster in another beer-fuelled session – a pity we wasted the effort in stripping paper in the first place! 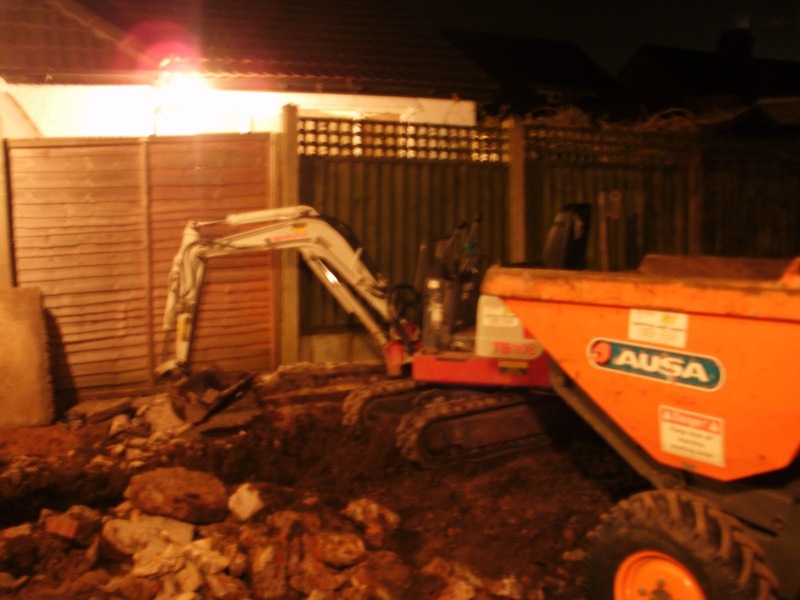 So now there’s a mini-digger and a pretty sizeable front-loader parked in my ‘garden’ and a hole in the ground. I’m incredibly disappointed to hear that they plan to dig for a week – a WEEK!! – before any upwards progress is made. Note to self – try not to bubble over! P.S. Project Manager not quite so enthused - there is a pillar missing that they shouldn't have moved and he is worried about the roof sagging and extra charges to us. Sometimes, I think, you can know too much.